With my recital days away (three, but who's counting? ), I've been putting the finishing touches on the music, the collaboration and the clothes. When I first tried to explain to my parents how important the recital was, I told them it was my wedding to music. You spend so much time preparing for this hour of your life, and it is a public forum in which you devote yourself to music, so "marriage" was the best analogy I could come up with. And at our wedding, I've always imagined Mr Wonderful in a beautifully tailored tuxedo, sporting a crisp bow tie, so naturally, I wanted the same for our big musical day. 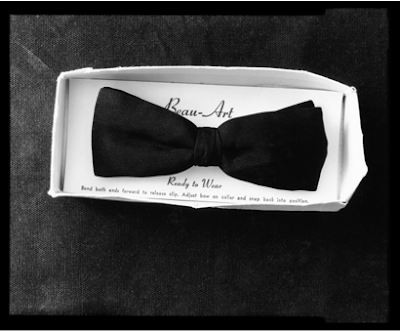 I ordered several "self-tie" bow ties (one in black silk, one in white, and another, just for fun) and was delighted when they arrived. I pulled Mr Wonderful over to the computer to watch a slew of YouTube videos professing "Simple Steps to Tying a Bow Tie". They lied. Before I knew it, the kitchen was a hotbed of anxiety and we were both wearing pathetic-looking knot contraptions. I went to the bathroom, where I quickly identified where I'd gone wrong. I came bounding out to show Mr Wonderful the advancement in my skills; he replied, "Isn't it great, you figured out how to tie this damn thing." And when I showed him how much simpler it could be if he shortened the tie, he growled, "I already did that." Apparently, I was not helping. With only three days to the recital, the likelihood that Mr Wonderful will figure out the Art of Bow Tying for himself is very good. But it made me wonder: how many grooms give their clothes a test run before the big day? I could imagine him throwing a temper tantrum and ending up at the aisle, sans perfectly planned tie. While your sweetheart might try to bodily harm you if you suggest a trial run of his ensemble for the big day, wouldn't you rather have the meltdown at home and recruit someone else to tie that sucker? Fabulous photo c/o Johnny Miller. Update: After another failed attempt, Mr Wonderful put his head in a pillow and refused to speak for several minutes. Then, he picked up the tie and simply said, "I need Creedence." He figured out the basics, then went into the bathroom, armed with Brahms Symphony No. 3, Allegro con brio to finesse the art.